Tig Notaro On Going 'Live' About Her Life Tig Notaro walked onstage hours after finding out she was diagnosed with cancer, and talked about it in a standup comedy set that Louis C.K. described in a tweet as masterful. 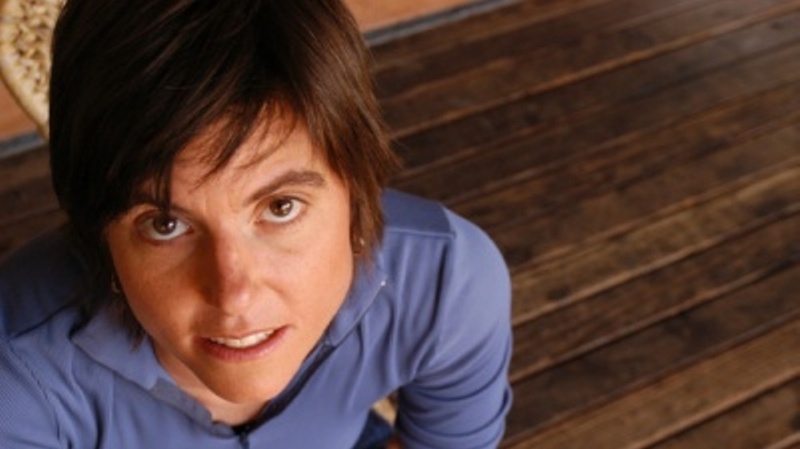 Notaro spoke with Fresh Air's Terry Gross about the set, titled Tig Notaro: Live. Comedian Tig Notaro dealt with a cancer diagnosis the best way she knew how — with humor. This interview was originally broadcast on Oct. 8, 2012. "Good evening, hello. I have cancer. How are you?" That's how comedian Tig Notaro began her set at Largo in Los Angeles the day she was diagnosed with Stage 2 breast cancer. As she uttered those words to the audience, there was nervous laughter, weeping and total silence in response. Comedian Louis C.K. was there that evening, and tweeted this about her performance: "In 27 years doing this, I've seen a handful of truly great, masterful standup sets. One was Tig Notaro last night at Largo." When she spoke with Terry Gross, it had been an eventful four months for Notaro. Before her cancer diagnosis, Tig had pneumonia and contracted a severe intestinal virus, for which she was treated in the hospital. Shortly after being released, her mother died in a freak accident — and then Tig and her girlfriend broke up. So when she got on stage that evening, Notaro told Fresh Air's Terry Gross, she was "in a very vulnerable, raw place." "I had no idea what was in front of me," she says. "It was really just taking blind steps." When Notaro conceived of the idea, "It just made me laugh so hard just in the shower" — but she wavered as to whether to include the cancer diagnosis in her set that night. Describing herself as a "dry, deadpan, one-liner comic," she says she rarely performs material as personal or revealing as her set at Largo was. "I was scared of offending people and confusing people," she says. "You know, thinking about people that maybe did have cancer in the audience, or had somebody that they loved that had cancer. And then the reality hit me that I have cancer — this is my story." After a double mastectomy, the cancer was contained. Notaro is now in remission, healthy and feeling well. Notaro has appeared on This American Life and Conan. Her set at Largo, titled Tig Notaro: Live, was first released exclusively on comedian Louis C.K. 's website. It has just come out on CD. Notaro was a writer on the Comedy Central series Inside Amy Schumer and appears in the new film In A World. "I'm so interested to see what this has done to me. And I do know that what I feel lucky for, and what has prepared me for now, is that throughout my comedy career, I have evolved and changed, and what I think has been important — not just in comedy but in life — and it's so cliche, but really, to take your own advice. And that's what I've done in my standup, and it has helped me because I started out a dry, deadpan, one-liner comic that didn't smile on stage. "And I have allowed myself, by taking my own advice, to write longer jokes. ... And going onstage to talk about my cancer and my mother's death, that's not something I would normally do. ... All I know is that I'm going to do whatever makes me feel comfortable, and I'm gonna do whatever I want to do and hope that the essence of me and what people liked about me in the beginning will come through." "I went to bed that night. I'm not on Twitter and I don't follow blogs. ... I woke up the next day and my phone when I turned it on just kept beeping, just so many voice mails and text messages. I didn't understand how the whole world knew I had cancer. I was so confused, and then to go from the 300 people that night to the world knew. ... My first thought when I was diagnosed was, 'Oh, I have to keep this a secret. I don't want to lose work.' And then that just blew the roof off that. It was just so funny, because I was talking to my manager just days before like, 'How are we going to keep this a secret?' "
"It's so interesting, I didn't account for laughter, which seems odd. But I had been talking to myself for so long at my apartment, and I was so focused on getting all of my material down. And when I got on stage at the coffee shop and people laughed, I remember being taken aback. I was like, 'Oh — oh, that's what I was telling you this for, was for the laughter.' But I just didn't even factor it in at all, but it was so exhilarating, so much so that I — the second night I did standup, I thought — because the first night went so well — I was like, 'Oh, this is so easy,' so I went and I competed in a standup competition and I got booed off the stage."